What Is Cavitation, And Its Effects And Precautions Against Cavitation? Cavitation is the phenomenon of formation of a vapour bubble in flowing liquid where the pressure falls below vapour pressure and sudden collapsing of this bubble at high-pressure region. Cavitation usually the result of rapid changes of pressure of the liquid. The cavitation cause erosion of surface as well as noise and vibrations. The cavitation occurs in pumps, orifice, venturi meter, control valves, impellers, etc. Consider a flowing liquid system. If the pressure of flowing liquid system becomes equal to or less than the vapour pressure, the liquid starts boiling and vaporize. The bubbles formed due to vaporisation then carried along the flowing liquid. This vapour bubble reaches the region of high pressure and then collapse, producing a shock wave. The pressure developed due to sudden collapsing of vapour bubble is very high. The surface above the where bubble collapse subjected to high pressure. The adjoining boundaries or surface is subjected to high stress and material from the surface gets eroded. Eventually forms cavities on the boundaries (that is why it is called cavitation). This phenomenon is known as cavitation. What are the effects of cavitation? The surface of conduit damaged and produce cavities on metallic surfaces. Considerable vibration and noise due to sudden collapsing of bubble. Cavitation effect efficiency of hydraulic machines. 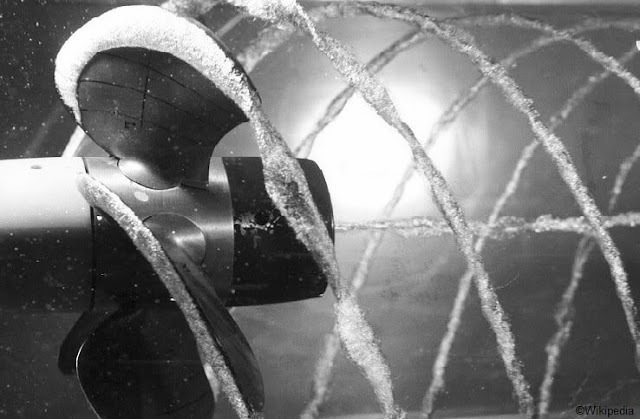 Efficiency of turbine decreases because the force exerted by water on the turbine blades decreases due to rough surface produced by the cavitation. What are the precautions against cavitation? Precaution against low pressure – pressure of liquid flowing in hydraulic system should not allow fall below the vapour pressure. For water, keep the absolute pressure head above 2.5m. Precaution against eroding action – provide a coating of special cavitation resistant material (such as aluminum-bronze, stainless steel).